Todolwen: New Pincushions Are Now Listed ..
New Pincushions Are Now Listed ..
just a short note to let you all know that I have just listed these four pincushions. If you have a spare moment why not go take a look at them in my Etsy shop. I´ve read about you at a german blog and so here I am. The things you create are realy wunderfull! 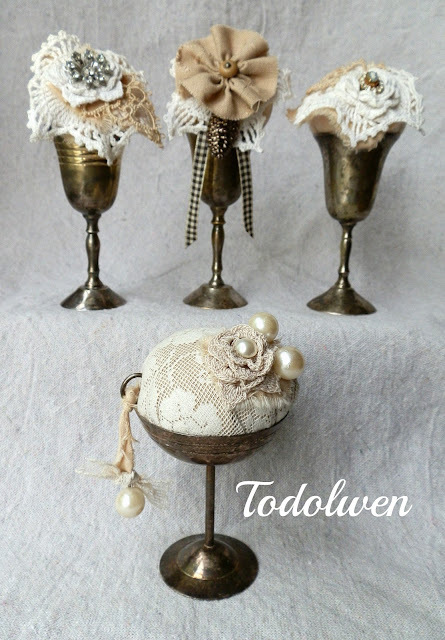 I like the oldfashioned things too and I´m happy about every treasure that came to me. Sometimes from my mum, aunts or friends who knew about my collecting passion. I´m happy to find you and will follow your blog. Just Listed .. New Treasures In My Etsy Shop ..
Something New To Create With .. I Love To Reuse ..
New Creations Listed in my Etsy Shop ..
Another Project I Am Working On ..
For The Very First Time .. The Same Old Subject Again ..
More Pincushions For My Etsy Shop ..
Our First Flea Market Trip Of 2013 ..
At Last ... I Can Tell You .. Sorry To Disappoint You .. My Last Spring Nest ..
My Last Spring Nest .. Outdoor Spring Cleaning Has Begun.. Working On My Decluttering And More ..
My UK Mail Has Arrived ..